Garden shears sharpening & secateurs sharpening information. Includes written guide on the differences between sharpening bypass shears & anvil shears. 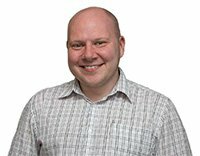 Video guide on how to sharpen shears and recommended shear sharpener products. Applicable to shears, secateurs, pruners & loppers. There are two main types of pruning shears, used for two different purposes. 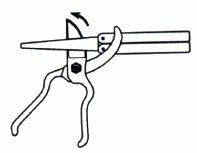 Bypass shears are designed for pruning live plant growth and function very similarly to scissors in that one blade (the single bevel blade) bypasses another (the anvil blade). The other type of shears are called anvil shears, which are intended for trimming dead wood. With the anvil style, a double bevel blade closes down on a flat anvil stop. The method of sharpening each style of pruner is slightly different. Place the sharpener level with the single bevel of the blade facing upwards. Stroke gently to sharpen along the curve of the blade, towards the outside tip of the blade. TIP: Clean, easy test cuts on a branch or plant confirm the sharpness. When sharpening double-bevel anvil pruners, start by stroking away from the cutting edge for 6 -7 strokes. Then turn the shears over (rotate 180°) and finish by stroking into the cutting edge. This removes the wire edge burr you may have produced by stroking away from the cutting edge in step one. 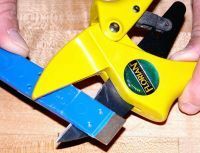 Since the cutting edge of the anvil pruners closes down on a flat surface, it is important to remove an even amount of material from the entire length of the cutting edge. If more material is sharpened away from one area of the blade, it will not close down completely on the anvil and therefore will not cut cleanly. 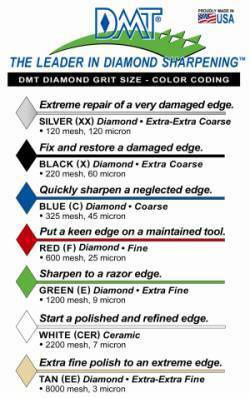 >> Buy a DMT Diafold® Flat Diamond File - click here! >> Buy a DMT Mini-Hone® Diamond Honing Tool - click here! DMT Diafold® Diamond Flat File - an excellent sharpener for narrow spaces such as shears, secateurs and loppers. Utilises a continuous diamond surface for the same precision quality results as other Diafold® models. DMT Mini-Hone® Diamond Tool - catering for confined or narrow, hard-to-reach surfaces, these sharpeners are ideal for shears, secateurs and loppers but are also useful for standard edges. The ergonomically designed handle provides comfortable sharpening, deburring and honing in tight spaces. If you have any questions about sharpening shears, secateurs, loppers or other gardening tools then please don't hesitate to contact us.